Obverse: Standing Venus with drape, holding cup. Reverse: Kite shield, quartered with a fleur-de-lys at 1 and 4, two chevrons at 2 and three horizontal lines at 3, floriate scrolls around. 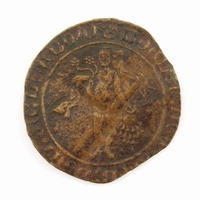 From the late 13th century to the end of the 14th century, purpose-made jetons were produced in England, similar in design to contemporary Edwardian pennies. Although they were made of brass they were often pierced or indented at the centre to avoid them being plated with silver and pass them off as real silver coins. Throughout the 15th century, competition from France and the Low Countries ended jeton manufacture in England, but this did not last long. Nuremberg jeton masters initially started by copying counters of their European neighbours, but by the mid 16th century they gained a monopoly by mass-producing cheaper jetons. This jeton is made by Hans Schultes I, master jeton maker in 1553, died 1584. Four generations of Schultes were jeton makers between 1515 and 1612, the last three all bear the name Hans. The Schultes family were the first to sign their counters.